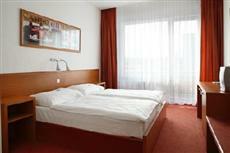 The Avanti Hotel Brno is located near the center of Brno, near the Cathedral of St. Peter and Paul. Guests will find themselves near Spilberg Castle as well. This hotel in Brno offers travelers easy access to all of the city’s biggest points of interest. The Avanti Hotel Brno offers travelers easy access to the city bus lines. Public transit offers guests transportation to many Brno points of interest as well as the airport. Major motorways can also be found nearby. Each of the guestrooms at the Avanti Hotel Brno offers climate controls and an array of amenities. All rooms include living rooms, kitchens, sofas, refrigerators, Internet access, and more. Each room also offers a private balcony as well as an en-suite bathroom. Guests of the Avanti Hotel Brno will find that Brno’s shopping and dining is within easy reach. There is a restaurant onsite at the hotel as well as a bar. Other hotel amenities include a 24 hour front desk, a business center, conference rooms, a currency exchange, and meeting rooms.